FAB HOME â€“ FAB LOCATION â€“ WILL SELL FAST! This fabulous Home & Land package nestled in the new predominantly owner occupier PineVue estate and situated on the backdoor step to Pacific Pines will sell very fast! 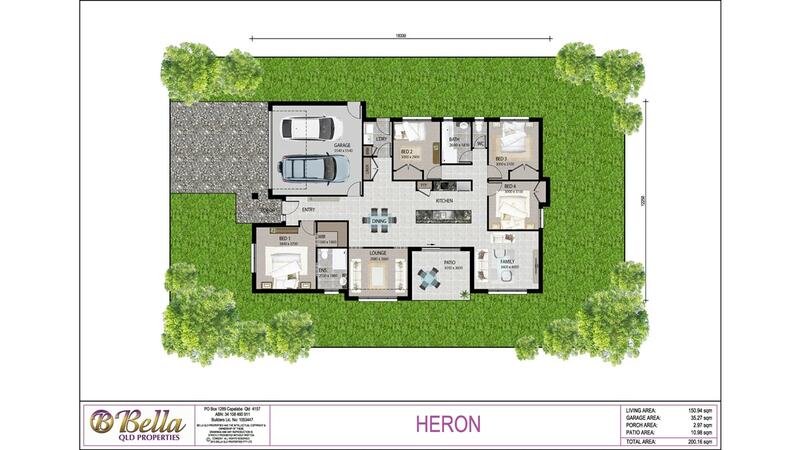 Bella offers our HERON home, 200m2 in size. Boasting 4 generous bedrooms, spacious open plan living, as well as a separate Lounge area, modern gourmet kitchen with Roman Stone tops & stainless steel appliances; and an outdoor entertainment patio for alfresco dining! This home is one you can enjoy without breaking the bank and has all you need completed with Bellaâ€™s Freedom Inclusions (worth $22,500) and quality finishes that stand out. Deal directly with the builder and experience our personalized friendly customer service – what more could you ask for, you wonâ€™t be disappointed! Take comfort in knowing you are partnered with an experienced quality Builder. We have many other designs and options available, Bella also offer flexible design solutions allowing you to tailor your home according to your lifestyle. â€¢	Call now for more information 0450 558 915 or drop into our Coolum display home located at 39 Hans Street, Coomera Retreat, Upper Coomera (Open Tues to Sundays from 10am). Bella QLD Properties Ltd is a boutique master builder and our homes are constructed to the highest standard. Being a family owned company we actually care about you and your investment. Pinevue is a sanctuary of natural beauty & serenity nestled at the backdoor of Pacific Pines yet only 20 minutes to the heart of the Gold Coast providing premium family living in a great location. Situated only a short distance to schools, shops, cafes, & parks, yet still within easy reach of theme parks, golf courses, Mt Tamborine, Sanctuary Cove and the world renowned Gold Coast Beaches!